As leaders seeking to succeed in business, sports or the classroom it is key to find, inspire and develop people to be confident with a mindset to persevere in the face of uncertainty and adversity and ultimately derive energy from the challenge. As a Player: Many years back, I met Stanford’s National Champion Ultimate team captain. He imparted some advice to me: prior to a game, scout the opposing team for a pivotal player and then line up against them with the intent of playing your heart out in the first couple of points – completely shutting them down on defense and consistently escape their efforts at defense while I was on offense. This served to build my confidence while also eroded theirs – hence I played the role of the confidence robbing villain. There’s power in finding ways to instill confidence in yourself. It will help your team win to instill similar confidence in your teammates. It is possible to erode such confidence in your competitors. Hence, the (im)balance of confidence can be shifted. It’s good to be wary of such tactics used against you. As a Team: The book Confidence Code speaks to confidence as an individual, but confidence that is also something that can exist at a team level. After breaking my collarbone, the spouses/partners of the players of my Ultimate team asked me to coach them. Three months later we flew to their first tournament and were matched up against last year’s national champs in the first game. Our team shouldn’t have completed a single pass, but at half time it was tied and at the end, we lost by one. It boiled down to inspiring them to play with confidence and earning their trust to try out totally unorthodox defensive and offensive strategies I’d come up with that their experienced opponents had never seen before. We switched between zone and person coverage within a point (previously unheard of). We also played zone coverage in the front and person in the back. Our players confidence allowed them to try these things and the effectiveness became a virtuous cycle for their level of confidence and energy. This can be the virtuous cycle of taking risks paying off. Granted, they were risks coming from a coach informed by 20 years of experience in the sport; nonetheless, the theories were never tried before and certainly risky. Likewise, having a novice team rattle these highly competent veterans (by using tactics no experienced player would’ve ever tried and they didn’t know how to defend against) became a vicious cycle for their confidence and energy they were yelling at each other on the field and during half-time – as I recall, they also didn’t do so well in following games. We had robbed them of their confidence and shifted it to our team – hence, once again, in hindsight, I can see myself again in the villain role here. The balance shifted resulting in a totally unexpected outcome. The veteran team did eventually regain their confidence and win the tournament. In the Math Classroom: As a 1st grade teacher, I was told by an Ed Professor that within the first week all students and the teacher do a subconscious stack ranking of “smartest” to “dumbest” and that pans out in terms of who gets picked on the playground and who gets invited to birthday parties. So, at the end of my first week in a 1st grade class I’d come to mid-year, I asked myself who was at the bottom, and it was obvious to see in a Portuguese girl that was struggling to keep up linguistically and hence otherwise. So, I asked her to stay with me during break and walked her through it with 3 yellow blocks and 2 red blocks … until she got it. She started crying and shaking, but with encouragement realized she just had to apply the same concept and she then started whipping down double-digit equations that 1st graders should not be able to do. The others noticed her excitement, came up to see what she was doing and were blown away. Within 2 hours she went from looking like the dumbest kid in the class to looking like the smartest and going from giving up on her own abilities to believing she could do anything. That shift in mindset stuck with her, and she remained a star pupil engaging from a place of confidence. What only came to me later, was the confidence eroding impact on the other kids who saw this child who they thought was clueless now being able to solve problems they couldn’t dream of solving; again, I was a villain. I did take a page from the growth mindset theory and helped them appreciate they hadn’t learned it “yet,” and then helped them master the theory behind fact families. On that day, all the students in that classroom made a transition from having a fixed mindset to having a growth mindset – it was no longer a question of someone being smart or dump, they could all learn to overcome uncertainty. In the History Classroom: I opened my fifth grade history class by asking for a raise of hands of who could tell me who discovered America. I got a lot of “Columbus” answers. When I asked them how they knew, I got things like my teacher told me, I read it in a history book, my dad told me. I asked: How does your teacher know? How does the author of the book know, how does your dad know? Now their curiosity was peaked as to where this new teacher was going. I asked how do we know anything? I asked them to imagine later during break Igor running in and yelling: “Mr. D., Mr. D. Johnny and Juan are fighting in the playground!” Imagine I bring the boys in and ask Johnny: Who started it? What’s he going to say? What if I ask Juan? What if I asked Johnny’s best friend? What if I asked Juan’s? Now I had eroded their confidence in what they knew and opened the doors to teaching them to seek primary sources of difference perspectives. The other great example to walk them through was the uncertainties of what really happened between the Conquistadors, the Aztecs and the Incas… The objective was to rebuild their confidence in their knowledge by helping them learn to find things closer to the truth themselves. Whether in history class, understanding an opposing teams strengths and strategies or evaluating a market a little skepticism can go a long way towards a better understanding. This same lesson could be learned at the office or on the playing field about letting go of assumptions by asking: How do you know, and how does your source know? See also my Orange Lesson. Confidence as a Pose: in her TED talk, Amy Cuddy explains how you can derive confidence from something as simple as a pose. In her visit to Pure, Diana McKenzie mentioned how important it can be how you sit. When I asked if she also felt if it was important where you sit, as I noticed the women in the audience sitting to the back and sides leaving the front rows empty, unlike the men, she agreed. Amy Cuddy also speaks to being a poser in terms of faking it until you become it. She speaks of the all-to-common imposter syndrome women in particular can feel when they feel they shouldn’t be in a prestigious college, business or role. Much as I highly recommend the book Confidence Code, I also highly recommend her TED Talk: Your body language may shape who you are. There’s also a related article about Imposter Syndrome and why going outside your comfort zone may be uncomfortable but also very advantageous: Why Impostor Syndrome Is Good For You. Willingness to take risks Mindset: Another thing Katty and Claire speak to in their book is how confidence can help you be willing to take risks – or as I like to think of it, discover a hunger for the challenges of venturing into uncertainty to make new discoveries and build new strengths. 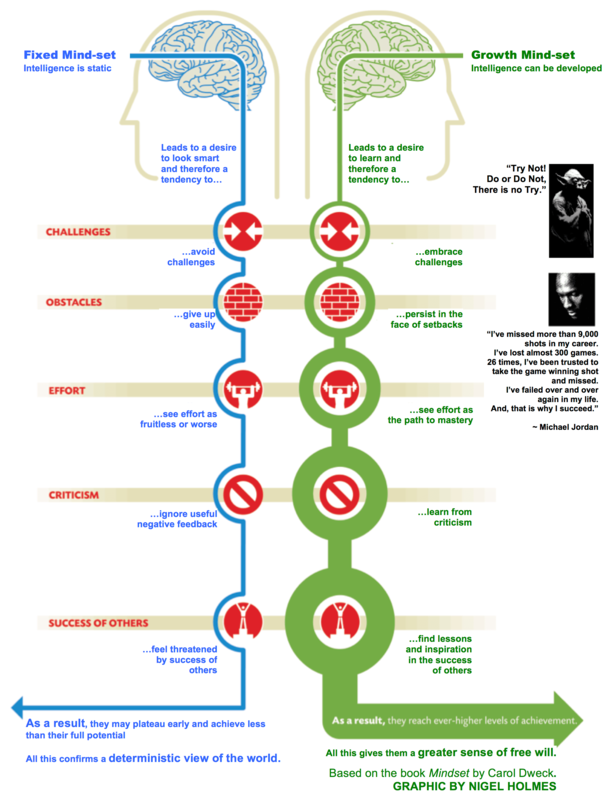 If you look into Carol Dweck’s theories of Growth Mindset, you can see how that willingness to take risks is a cornerstone of the Growth Mindset. As a Government: One of the greatest challenges is to persevere is when your government is the villain against you. When you consider what confidence and courage it took for Rosa Parks, Martin Luther King, Gandhi, The Dalai Lama, Oskar Schindler, Nelson Mandela, or Malala Yousafzai to find a voice to speak out and inspire others and draw courage from their convictions, you can only be left in awe. On the Battle Field: I don’t have personal experience on the battle field, but a friend recommended Robert Coram’s Boyd – The Fighter Pilot Who Changed the Art of War, and it turned out to be a fascinating read applicable in many venues. John Boyd’s OODA Loop and theory behind it. It’s also clear that Boyd derived strength and conviction from those that challenged him, and the greater force they were, the more it inspired him to excel. It was born out of his experience as a fighter pilot combined with reading things like Sun Tzu’s The Art of War; however, it’s applicable in a very generic sense as he concluded later in life as it started getting used in business and seemed reflected in the Toyota Production System. Perhaps its not so much what you see, but how you see it. If you’re interested in further thoughts on this topic, please refer to my follow-up post: The Confidence Villains (Continued).